look at this conclusion: “Shoes affect the gait of children. With shoes, children walk faster by taking longer steps with greater ankle and knee motion and increased tibialis anterior activity. Shoes reduce foot motion and increase the support phases of the gait cycle. During running, shoes reduce swing phase leg speed, attenuate some shock and encourage a rearfoot strike pattern." 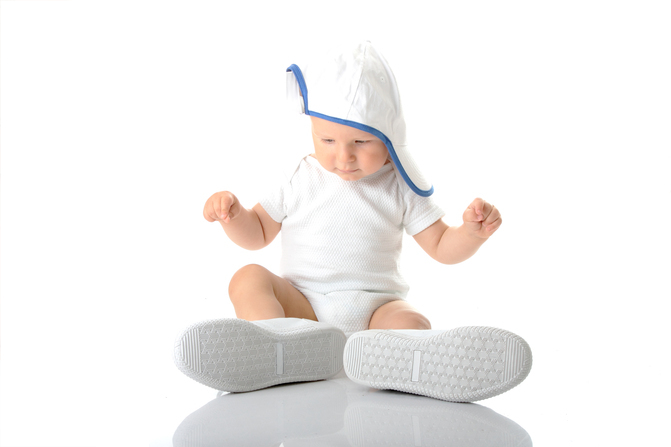 "Shoes affect the gait of children.” Shoes effect EVERYONE’S gait, not just kids. They alter the ground reactive forces, limit some ranges of motion and thus can promote a compensation or mechanics that you may not have seen previously. Take off one of your shoes. Lift your toes up slightly so you are centered on your tripod. Stand on your “barefoot” leg with your eyes closed. See how long you can stand without faltering. Now repeat that with your shod foot. Some difference, eh? I thought shoes dampened proprioception…They do. But they also give you more support and mechanics that you didn’t have previously, so the foot doesn’t have to work as hard. “With shoes, children walk faster by taking longer steps with greater ankle and knee motion and increased tibialis anterior activity.”Remember we are talking about kids here. Longer steps because with a shoe we promote heel rocker and because of the added support, more stability (or at least more perceived stability). This means more confidence. Greater knee and ankle motion because of the increased stride length. Greater tibialis anterior activity because of greater dorsiflexion of the foot because of the increased weight (the shoe adds ounces and this muscle must work harder to attenuate the foot as it approached midstance) and increased heel and ankle rocker. “Shoes reduce foot motion and increase the support phases of the gait cycle.” Shoes constrain the foot and reduce available ranges of motion (yes, even non motion control shoes). Less motion (and thus proprioception) means less feedback to the brain about muscles length and tension (via muscle spindles and golgi tendon organs). The brain will need to have the foot have more contact with the ground to know where it is in space. …and encourage a rearfoot strike pattern.” most likely due to the cushioning (remember from the recent Kenyan study about barefoot heel strikers? (click here if you need a reminder) They were more likely to heel strike on softer surfaces) AND the increased stride length (which would require more ankle dorsiflexion). Wow. Shoes really do make the, er….kid. The Gait Guys. Making it real and increasing your shoe and gait IQ with each post. J Foot Ankle Res. 2011 Jan 18;4:3. doi: 10.1186/1757-1146-4-3. Effect of children’s shoes on gait: a systematic review and meta-analysis. Discipline of Exercise and Sports Science, Faculty of Health Sciences, The University of Sydney, Cumberland Campus, PO Box 170, Lidcombe, 1825, NSW, Australia. cweg6974@uni.sydney.edu.au. Eleven studies were included. Sample size ranged from 4-898. Median Quality Index was 20/32 (range 11-27). Five studies randomised shoe order, six studies standardised footwear. Shod walking increased: velocity, step length, step time, base of support, double-support time, stance time, time to toe-off, sagittal tibia-rearfoot range of motion (ROM), sagittal tibia-foot ROM, ankle max-plantarflexion, Ankle ROM, foot lift to max-plantarflexion, ‘subtalar’ rotation ROM, knee sagittal ROM and tibialis anterior activity. Shod walking decreased: cadence, single-support time, ankle max-dorsiflexion, ankle at foot-lift, hallux ROM, arch length change, foot torsion, forefoot supination, forefoot width and midfoot ROM in all planes. Shod running decreased: long axis maximum tibial-acceleration, shock-wave transmission as a ratio of maximum tibial-acceleration, ankle plantarflexion at foot strike, knee angular velocity and tibial swing velocity. No variables increased during shod running. all material copyright 2013 The Gait Guys/ The Homunculus Group. All rights reserved. Yea, that means ask before you touch!